Mr. Rakam looked at his children, first Nomish, then Alila. "Now, think on the story you are about to hear, the ancient bedtime tale passed on from our parents, and their parents before them. Like all Ramash traditions, it is forbidden as well. Have you ever told a soul that you know it?" Both Nomish and Alila shook their heads, and at her own mother's probing glance, Hadlay did the same. "Well, then, you've passed the first test. Since you have been faithful in small matters, you can now be trusted with weightier matters." Mr. Rakam smiled. "We begin this evening as we have ended many evenings before, telling you the story of the Mirror of N'de. You are initiates now, no longer children, so this is the last time you will hear this tale until you tell it to your own children." "But why is a silly bedtime tale forbidden?" Nomish asked. Hadlay sat straighter. She had wondered this as well. "It is enough that it is Ramash," Mrs. Rakam said, a note of bitterness in her voice. From Goodreads: In the mythical city of N'de lives thirteen-year-old Hadlay and her people, the Ramash. Scorned and abused by the unloving and absent Emperor, the Ramash are poor people, placed second to the ruling class of the Oresed. Young but bold, Hadlay rages against the injustice in her city. When she is chosen for the honor of serving the Prince in the Tower, she hopes to find a way to right the wrong . . . but soon discovers that things are worse than she believed. Notes: I don't think of myself as cynical, but am perhaps a little too much so to be reading and reviewing evangelical fiction. Which is a shame, because this is not a bad story, and if you're ten, or if you're completely unfamiliar with Biblical mythology, or if you're very new to and enthusiastic about the concept of symbolic fantasy, this might just be the book for you. 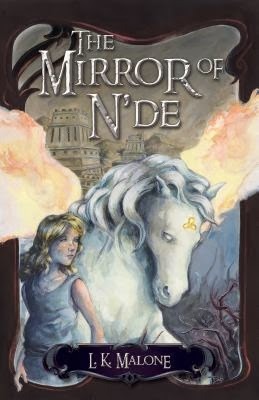 It's got magic (though the author pulls a real reader-gypping with that one), some thoughtful worldbuilding, a strong share of page-turning mystery, a bright winged horse-creature, and an adventurous protagonist who is prone to very serious mistakes. All in all, it's quite readable. As far as I was concerned, however, the symbolism was overpowering. I was frankly amused by the origin narrative featuring Mada and Avakh getting kicked out of the paradise N'de—after looking in a mirror, of all things, which presumably reflected their names as well as their faces. (Or close, anyway; Eve, in Hebrew, is usually transliterated Chava.) At least it warned me to brace myself for the almost word-for-word Sunday School plan of salvation denouement. Somewhat more unfortunately, and possibly more personally: as a reader I felt backhanded by what seemed like an obvious attempt on the story's part at being both The Second Coming of Narnia and The Christian Child's Safe Alternative to Harry Potter. Either requires the skill of a circus performer, being a stab at doing the impossible. Lewis is a dangerous author to emulate; he got away with bald allegorical elements and weird mythic mashups by having an exceptional knowledge base, a steady artistic hand, and an unsuspecting audience. The same is true, though to a lesser extent, for Rowling, whose tricks, especially gimmicks like the too-apt naming and the Mirror of Erised, have been so widely read and discussed to death that they probably shouldn't be used again in this generation of literature. For Malone's sake, however: Hadlay and Nomish were interesting and sympathetic, and there were many moments of rewarding detail. Cynicism notwithstanding, I read late into the night, desperate to find out who was bad and who was good. If the reader's dragons are not too watchful around evangelical symbolism, there's a decent fantasy tale in there. Nice review. This book has been sitting around on my Kindle for awhile. It might have to sit there awhile longer. Yeah, a lot of books get on my Kindle that way too. Wait, it's an evangelical Christian allegory?? I read the quote and the publisher's description and thought, "Hey, that sounds kind of good!" So maybe I'm the unsuspecting reader the author has in mind? (I have other beefs with Lewis, but I didn't think Narnia was too clunkily allegorical until The Last Battle -- maybe I'd feel differently if I read them now, but it's not like there aren't a lot of dead-king-resurrection myths going around already). And I kind of already buy the idea of a similar-but-different Eden myth with garbled character names as part of a Fantasy Alt History worldbuilding. And I love the idea of a protagonist who makes tons of mistakes. How does the author cheat the reader with regard to magic? You can spoil it. Is it the Power of Prayer? Magic is funny and cute, and Hadlay's good at it... and it turns out to be a bad thing that a follower of the Being should never do. As a story construct, that's not necessarily a bad idea, if you give the reader some warning about the dangerous side of it. I didn't feel I was warned about magic specifically. But it's admittedly hard to be fair, since as a Harry Potter fan, I just felt sucker-punched. Malone is herself a Potter fan, however, so possibly I'm overreacting there, too. The allegory gets clunkiest right at the very end, but if you're not put off by the similar-but-different Eden myth, you might get through the rest okay. I'll be interested to hear what you think of it if you read it. Why bad? Does it tear chunks off your soul?? (Maybe I should just read the book). So interesting! I don't know why I never thought about evangelical fantasy, but of course it exists. I'd like to read it now, out of curiosity, to appreciate the good and make note of the bad!